Holy! 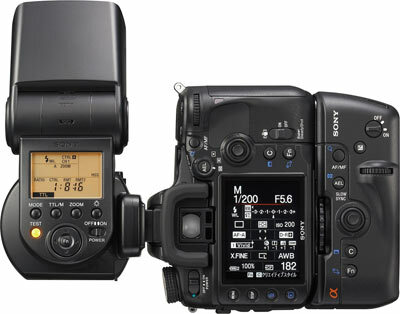 The new Sony HVL-F58AM flash has been announced! It turns sideways for portrait orientation! They call this Quick Shift Bounce. It goes 90 degrees left and right. It rotates up and back 150 degrees for rear bounce mode (and 10 degrees down for macro). You can combine BOTH sideways and rear bounce for rear portrait ‘foofing’. 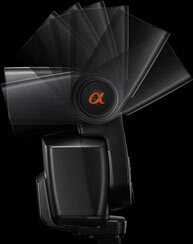 This is probably the biggest Sony innovation to the Alpha series just yet – the rest of the things people go OOOH about were actually done by Minolta ages ago. Guide Number 58 meters at ISO100, 105mm flash zoom, F1.0 lens. Divide the guide number by the aperture to get the actual range. It also can be used as a wireless controller, so there can be a flash on the body and 3 wireless groups. Minolta invented wireless TTL flash, but Nikon took lead with their Creative Lighting System. Hopefully, with this, it has caught up! The PDF file shows something else – an upsized hotshoe foot, looking bigger than the one that comes with the Nikon SB-800. Unfortunately it’s shrunk down so I cannot make out where else the foot connects. Though, a question – how would the F36, F42 or F56 identify which group it belongs to? This entry was posted in Geek, Pictures on June 20, 2008 by 2konbla. Sweet, the ball looks alien-ish though. Of course, what I would prefer is that its able to go ABOVE the body, since sideways flashes tend to leave oddly shaped shadows, that needs to be killed with another light from the side. Any idea how much does it sales in the market? Oh ya do you have any email add? as i got sony price list wanna send to you as i dont know whether it true or not..
Dude man, don’t despair – the F42 is still a very good flash and especially so at its price! One of my friends knew about this ‘flagship flash’ for a while, but he needed a flash for the job so he got the F42. Besides, the F42 can be sold for a F58, or better still, he can get the F58 in addition to the F42. In fact, I’m thinking of getting the F58 in addition to my F56 so I can make a 2-light wireless flash studio.